MAVIM INDIA (Mahila Arthik Vikas Mahamandal), Maharashtra Published Job Notification for 04 Programme Officer Posts. Candidates who wish to apply must look at MAVIM INDIA Recruitment 2018. Eligible candidates can apply offline before 04-01-2018. Education Qualification: MSW/MBA/Diploma in Computer and More. For Post wise Education Details follow the detailed advertisement. Interested & Eligible candidates can send their application along with all the necessary documents and testimonials to Vice President and Managing Director, Mahila Arthik Vikas Mahamandal, Griha Nirman Bhavan (MHADA), Mezzanine floor, Kalanagar, Bandra (E), Mumbai – 400 051. Start Date to Apply Offline: 30-12-2017. Last Date to Apply Offline: 04-12-2018. 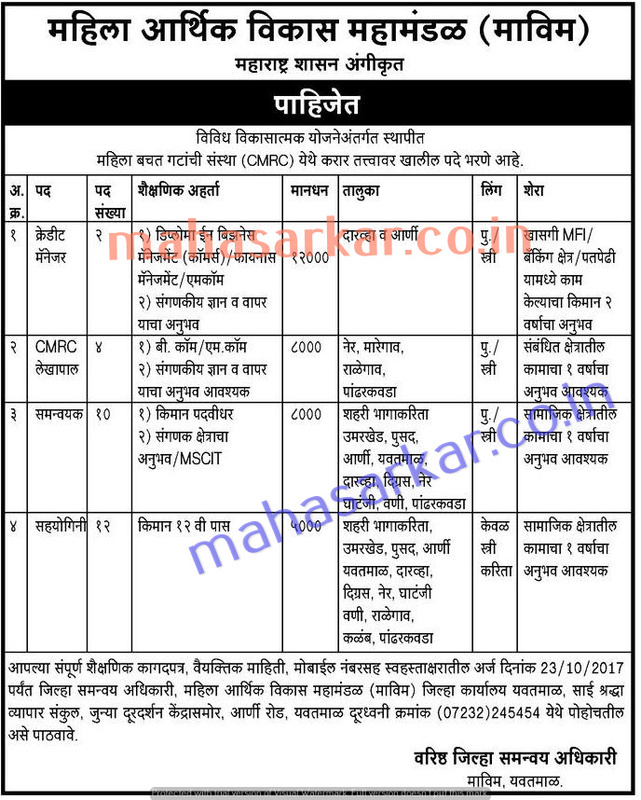 MAVIM INDIA (Mahila Arthik Vikas Mahamandal), Yavatmal Published Job Notification for 28 Coordinator – Collaborator & More Posts. Candidates who wish to apply must look at MAVIM INDIA Recruitment 2017. Eligible candidates can apply offline before 23rd October 2017. Education Qualification: Diploma/B.Com/M.Com/MSCIT/12th pass/Graduation and more. For Post wise Education Details follow the detailed advertisement. Interested & Eligible candidates can send their application along with all the necessary documents and testimonials to C/o. Sai Shradha Vyapar Sankul, 1st Floor, Doordarshan Kendra, Arni Road, Dist. Yavatmal – 445 001. Start Date to Apply Offline: 12th October 2017. Last Date to Apply Offline: 23rd October 2017.